Serving SW Florida since 1960, Siggs Air Conditioning is an industry leader in heating and cooling design, installation, and service! 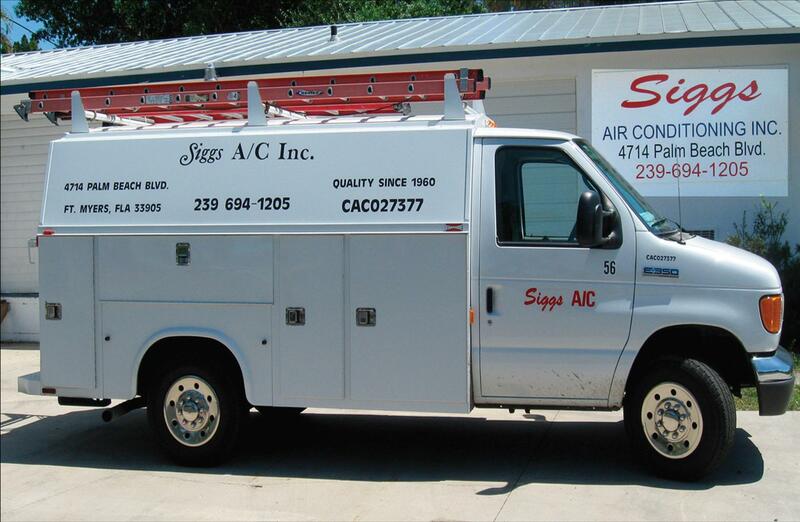 *One of the Siggs Air Conditioning service vehicles that could come to service you! Since our doors opened, we have maintained our standard of honesty, integrity and quality. Our customers expect excellent service, and we will deliver no less. Call today and take the first step towards longer equipment life, a lower electric bill, and your peace of mind. At your home or business, trust the air conditioning company that so many South West Floridians have relied on for almost 50 years. Established in 1960 by W.C. Siggs, the company has grown to be a leader in the SW Florida market. His son, Richard Siggs, is the current owner and president, keeping the family business of quality service going. Richard and Sharon Siggs have worked many years with Siggs Air Conditioning to lead it into the 21st century as a reliable, quality, and honest heating/cooling company. As a family owned company, if it's not what we would do for our family, it's not what we would do for you!